Toronto and Montreal are two of Canada's most popular destinations. Toronto is in the province of Ontario, and Montreal in the neighboring province of Quebec. Though both are big, multicultural Canadian cities, each has its own distinct vibe and appeal. These two cities are about a 6 and a half hour drive away via major highways or longer if you care to take a more scenic route or make stops at any of the many interesting highlights along the way. Flying, taking the bus or train or even riding your bike are also viable options to traverse the 337 miles (539 kilometers) between Toronto and Montreal. There are more flights between Toronto and Montreal than between any other two Canadian cities. Air Canada, Porter, West Jet are the three Canadian airlines that fly this route. The advantage of flying Porter is that the Billy Bishop Airport is in downtown Toronto, making it an especially convenient commute for those visiting Toronto and it will shave at least an hour off flying out of Toronto Pearson International Airport, which is Canada's biggest and busiest international airport, located a 30 minute drive--if there's no traffic--from downtown Toronto. The Montréal-Trudeau Airport is about a half hour drive from downtown Montreal. Expect to pay at least Cdn $275 to $400 for a return Toronto-Montreal flight. The flight between Toronto and Montreal takes about an hour and 15 minutes. Driving between Toronto and Montreal should take between 5 and 6 hours. The two cities are connected by a major system of highway: the 401 Hwy in Ontario becomes Hwy 20 and goes straight into Montreal and on to Quebec City. The drive between Toronto and Montreal is long, but there are a couple of nice spots along the way that make for good places to fuel up and have a bite. The best choices for an overnight to break up the trip would be either Prince Edward County, a charming agri-rich area that is popular with the Toronto weekend crowd or Kingston, which is a city steeped in history and halfway between the two cities. Taking a bus to Montreal from Toronto will take just a little longer than a train and not even that much more than a plane flying out of Toronto Pearson International Airport, factoring in getting to the airport and waiting for your flight. Megabus came on the scene in 2009 offering daily express bus service between Montreal and Toronto on double-decker buses equipped with WiFi. The trip takes about 6 hrs and costs $10/15 to $65 plus tax one way (as of 2012). Greyhound Canada: Greyhound offers connections to many smaller towns as well as various stops within the two cities. The trip between Toronto and Montreal takes between 8 and 9 hrs and costs between Cdn$30 and $65 plus tax one way (as of 2012). Via Rail is Canada's national passenger railway and provides daily, downtown to downtown service between Toronto and Montreal. While the train ride is not particularly scenic, it is comfortable, reliable and convenient. Passengers may choose between economy and business class. Free WiFi is available among on board as well. The trip can take from under 5 hours to more than 6 hours. The longer trips have a stopover in Ottawa. A one-way economy ticket from Toronto to Montreal and costs about Cdn$125 plus tax (as of 2012). Keep an eye on VIA Express Deals to save up to 75% on fares. A guided tour may be a good idea if you have limited time and want to make the most of your trip and learn as much as you can during your travels. 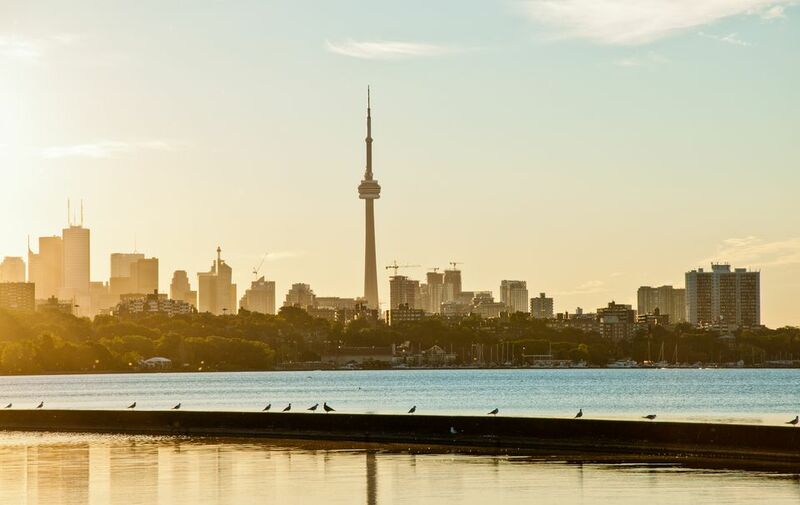 This two-day tour from Montreal to Niagara Falls and Toronto gives travelers a brief introduction to three of Canada's biggest destinations. It may not be the way that most people travel between Toronto and Montreal, nevertheless, if you have 10 days and a reliable bike, you may want to follow Brian Hedney's detailed route itinerary that takes you through small Ontario towns, historic communities and waterside trails. The route Brian has chosen is not the fastest, but one that he considers safer and more scenic.